My first meal in prison was at Victor Verster. Lunch was a lavish, three-course affair with enormous plates of meat and roast potatoes sunk in gravy. I was on an indoctrination programme. As head boy of my school, the Nationalist government was grooming us for what they thought we as young leaders would have to take charge of; Nelson Mandela was already in Pollsmoor (since 1982), but still a long way off from when Verster would become his gateway to freedom. The Nats failed. Before I turned 20, I’d read Michel Foucault’s tour de force thesis on the birth of the prison. Ever since, I’ve been firmly opposed to the behemoth Western carceral system. I hold such deeply unpopular beliefs as being in favour of prisoners exercising their constitutional right to vote. Otherwise, why would they reform or abide by laws in which they have no say or representation when released into a society that excludes them? We never want a society split into a ruling class and a vast, disenfranchised, recidivist prison class, as is steadily growing in the United States, no more than we want the Eastern European scenario of a criminal plutocracy. Sadly, I do concede (with Charles Dickens) that some people are irredeemably wicked and there is no choice but to separate them from us. Yet they are the exception that should not prove the rule. When people call into radio shows and scream about how prisoners languish in luxury in secure buildings with electricity, sanitation, doctors and three meals a day watching television, I see red. If it is so gemütlich, why do these same people phone in to scream about how incompetent the government is because some kid they know was hauled in overnight for a minor offence and ended up gang raped and now has an incurable disease? Fortunately for South Africa, many of our leaders have experienced injustice that placed them on the wrong side of the bars; for the most part, it has made them more humane, less judgemental. Which brings me back to lunch, at what must be one of the most unusual restaurants in the world, Pollsmoor maximum-security correctional facility located in the heart of one of the wealthiest areas in Cape Town, on the border of Constantia. As part of its rehabilitation programme, the prison has a public restaurant. It caters mostly for the wardens and their families, but it also attracts some locals and even foreign tourists. Most visitors to our country hope and pray they will never meet our criminal elements. But Munchkin has some peculiar friends. In February, an eccentric British couple decided to celebrate Valentine’s Day by doing something different; a breakfast for 60 of their closest friends; eggs scrambled, tomatoes grilled, bacon crisped by inmates, and served with croissants by murderers. Several people at the Valentine’s party had some sort of banditory done to them in the past, so it was impressively good-spirited of them to be guinea-pigs for offenders. What if they suddenly came face to face with one of the men that had tied them up and held them at gunpoint in their home? wondered Munchkin. Ask correctional services to add on a few months for getting the eggs wrong? Now there’s a way to incentivize good table service. On arrival, the guard checks our car boot at the gate. Then it is a bleak drive past the crowds of demoralized visitors waiting at the entrance, along a road of high security fences, face-brick bunkers, barred windows, razor wire, and an enormous guard tower (probably built in the 1970s) strong enough to withstand rocket attacks by one of our youth leagues. The restaurant is as one expects – a public works canteen, tiled floors, utilitarian tables, and a few stabs at softness with those rattan, ceiling fans and faux nouveau lightshades. The radio is playing. Several wardens in their drab brown coats are watching the floor. We’ve come for lunch. Our waiter, Waleed, is a friendly, well-spoken convict. Couldn’t hurt a fly, I think. No alcohol is served; we order ginger beers. “Suppose we can’t ask him what he’s in for,” whispers Munchkin. Neither of us can bring ourselves to be impolite in the face of his genteel manners; besides, there are actual metal knives and forks on the table. The menu is an A4 page of yellow cartridge paper. It lists chicken schnitzel (R32), chicken cordon bleu (R24), chicken wings (R33); for beef: schnitzel (R42), Lady’s T-bone (R42), sirloin (R38), rump (R40), burger (R23). Pork spare ribs “large” is R60. There are “kiddies” choices too, such as two Russians for R18. Under a section of daily specials are tripe, lungs and hearts, vetkoek and ox head. Today’s special is a “Gatsby”, a Cape Flats sandwich consisting of a two-foot-long bread roll with various fillings. The classic version is stuffed with steak, salad, chips and spicy relish. It’s a truculent Cape take on Durban’s better-known, laid-back bunny chow. Waleed recommends the calamari (200g, R32) and the deep-fried, crumbed hake (R33). It comes with “tossed”, which I discover means salad. Snoek ‘depending on availability’ is R25. The food takes a while to arrive. It is over-salted, but not bad. I have had worse and paid more. Coffee is a sachet of Ricoffy with a pot of lukewarm water. Lunch for two comes to under R100. Does he get the tip? Waleed says not; it goes into a general fund. But, would we please sign the visitors’ book? I hope habitually rude restaurant patrons will keep this story in mind. One day, they may meet their match, and come up against a waiter trained at Pollsmoor! Pollsmoor Restaurant, Steenberg Road, Tokai. Tel: 021 700 1128. This year’s sardine run was much later than usual. In the past 10 years, with one exception, the sardines start to amass off the south coast in June swimming north; on exceptional years, they reach Durban. By mid-July this year, newspaper headlines were crying, ‘Where are the sardines?’ The waves finally turned silver with fish off Umhlanga on July 21. Roadside vendors flogged crates of the little fish for R300 (the price had dropped from R500 at the hesitant start to the run). The bounty continued into the first weeks of August up to Ballito Bay. The sardine run is an underwater version of the wildebeest migration on the Serengeti and undoes it on a biomass scale. It attracts not only hundreds of whales, thousands of sharks, tens of thousands of dolphins, and a hundred thousand seabirds, but it is also good bait for tourists. There are several festivals centred around Port Edward and Margate beach. The annual feast brings bird- and whale watchers. Spotter planes track the giant shoal, which can be a staggering 7km long, and direct avid scuba divers to where they can see a feeding frenzy of predators, among them the mysterious Bryde’s (after a Norwegian surname pronounced broo-dah’s) whale, bottle-nosed dolphin, copper and hammerhead shark. Our local sardine (sardinops sagax ocellata) populations rise and fall dramatically, by the billions, due to a host of slenderly understood environmental factors. Monterey, California, the underclass setting for John Steinbeck’s novel Cannery Row, went from three million cases of cans to next to nothing by the 1950s; the abundant Celtic sardines off Brittany suddenly disappeared in the 1960s. Estimating allowable catches is clearly tricky. Currently, the national annual South African quota is 90 000 tonnes for its hundred-odd license holders. Most of these little fish, the sexually mature bigger ones called pilchards, are beheaded and canned in brine, tomato sauce or ‘vegetable oil’. Olive oil is best, and some people swear the sardines mature in the can and should be left in a cupboard for three years. Lucky Star (in the flat, ring-pull can) and Saldanha (in small cylindrical cans) are two popular brands of South African sardines. We also import a lot. John West offers Scottish sild sardines, while their regular sardines are products of Morocco or Portugal. The Cape Point brand is actually from Morocco. King Oscar oak-smoked sardines are packed in Poland. Woolworth’s brisling sardines (called sprats) are also packed in Poland and fished in the North Sea and the fjords of Norway. To my taste, the best of the canned are these tiny brisling with lots of pepper on a buttered, lightly-toasted baguette. But nothing compares to fresh sardines. Increasingly, restaurants are advertising themselves as ‘sustainable seafood’ establishments, but you can eat sardines in good conscience anywhere, scientists tell us. That is, if you can find them on the menu. The upmarket Bahia in the V&A Waterfront used to do stunning sardines years ago, but have dropped the dish. Mariner’s Wharf doesn’t bother with sardines anymore either. Your best chance will be at those restaurants that offer a variety of fish for their catch of the day, such as the Cape Town Fish Market. The day I called around, I found only one place with fresh sardines, The Codfather in Camps Bay. Among the first to offer sushi on a conveyor belt, this casual eatery was unusual in its day for Cape Town. At a deli-style counter, laid out on crushed iced was fresh fish – yellowtail, butterfish, kingklip, kabeljou, sole. You order by weight, as many species as you like. You have to ask if you want to know the price, something that puts many locals off, and has tourists spending far more than they expect. 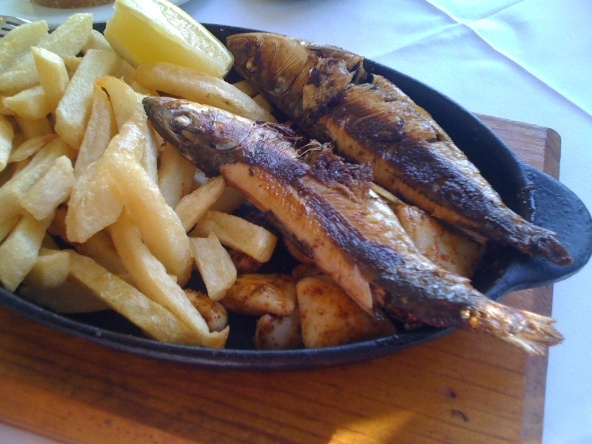 I ordered a 100g calamari (R36.30) and two glistening sardines (R37.72). The manner of their display made them look like decoration for the other fish. The waiter hid his disappointment well, but it was as if I had ordered the plastic lobster. They still had healthy staring eyes. Sardines go bad quickly; apparently, it’s the downside to their being so rich in omega-3 fatty acids. I’ve had rancid ones in a pricey restaurant that subsequently went bankrupt. My table at the Codfather, shaded by a loquat tree in bud growing outside, had a glimpse of the sea and the windows opened to the air. Rap music played in the background. Four sauces arrived in glass ramekins: garlic butter, apricot, lemon butter and a lethal chili sauce. The fish is gutted and cooked whole (as it should be), and served in an oblong, cast-iron skillet. I start by slicing the head open from underneath. The gill filaments tumble out and release a smell of the sea I find appetizing. Some people eat the unpleasantly bitter, black, pulpy meat inside the head. The backbone is easily removed together with the main skeleton. You don’t have to be too careful about this; most people can eat the bones safely, but always have some fresh bread on hand to help down the occasional stubborn one, though even these are less trouble than a popcorn husk. The Natal Sharks Board offers a Sardine Run hotline annually (around June to August) on 082 284 9495. The Codfather, 37 The Drive, Camps Bay. Tel: 021 438 0783. Tea can be a confusing term. It may refer to any beverage made from pouring hot water over some part of a plant – fruit, flower, or leaf. True tea however, whether white, green or black, is made from a single species of the evergreen shrub Camellia sinensis, native to south and east Asia. The differences rest in its few varieties (such as c. assam) and in the way its leaves are prepared through wilting, bruising, and fermentation. Earl Grey tea for example is treated with bergamot. From China, tea spread across the world, engendering a variety of traditions. The Arabs, like the Russians, drink it from glasses and prefer black tea with lots of sugar. The Indians boil it with spices to make masala chai. Tibetans mix it with rancid yak butter to form a paste. The English add milk to reduce its astringency. Thanks to the British passion for tea, we are as much a tea drinking as a coffee-drinking nation. Apparently, we consume 23 million kilograms of tea per annum, most of which is imported. Ceylon tea consumption has surged amongst the rising middle class, yet overall, recent market research suggests that coffee is taking away market share. An awareness of the huge variety of teas that exist and an appreciation for quality and the finer points of preparation is a recent phenomenon. You still see guests at the Westcliff and the Mount Nelson hotels looking slightly bemused when a glass teapot arrives with a separate filter and an egg timer. 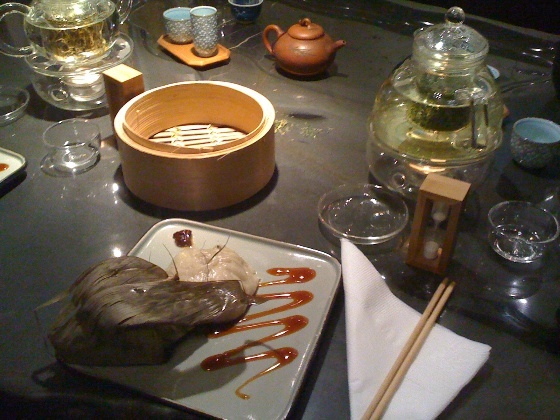 The tea for these Orient Express establishments is specially blended by Ming Wei, tea master of the Nigiro tea company. Partitioned off by a glass wall inside the Origin coffee shop, is the tranquil, softly lit, Nigiro tearoom, where they offer a Taiwanese tea ceremony. A wall of clay pots is a showcase for the nearly 100 hundred varieties of tea they sell. Seated at a black marble table, which has a slight depression in the stone to serve as a basin, Wei’s assistant, Nehemia Simons explains that the tea ceremony is about “sharing each other’s experience”. First, all the vessels are warmed by filling them with boiling water (filtered) from a large and handsome earthen pot. In this ceremony, oolong tea is chosen, as it is has a complex structure, somewhere between black and green tea, able to unfold over multiple infusions. With a bamboo spoon, Nehemia gently places a layer of Ali High Mountain tealeaves in a tiny, clay pot. Ali is one of five mountains on Taiwan. The tea is grown at 2000 feet above sea level where the slow growth produces more intense flavour in the leaf. After pouring the hot water over the leaves, Nehemia seals the clay pot by pouring over its lid the water used to warm the receptacles. For this first infusion, the tea is left to steep for one minute, before it is decanted into a medium-sized, glass pot called ‘the sea of tea’. If poured directly from the clay brewing pot, each cup would be weaker. The sea ensures everyone enjoys equal strength. The tea, a beautiful golden colour, is now poured into small, ornate, cylindrical, porcelain cups – the fragrance cups. These are capped with equally small, matching, porcelain, bowl-shaped drinking cups. With thumbs on top of the inverted drinking cup and fingertips holding the fragrance cup, one flips them over. An air bubble is left trapped in the fragrance cup. You slowly release the fragrance cup, feeling the tug of the air pressure. Then you channel the empty cup to the nose. I can taste the tea just from the smell, the tannins at my sternum. We now enjoy our first sip of the tea. Nehemia holds his drinking cup delicately on his fingertips with his thumbs up in the air. There is a buttery scent that becomes floral. For the second and all the subsequent infusions, the tea brews for only 45 seconds. The clay pot is sealed with the remaining tea from the previous infusion. The aromas are very similar to the first, perhaps more subtle, and feel ‘warmer’. Nehemia finds it less milky now. He opens the pot and takes out a few leaves with a pair of bamboo forceps. You can see the leaves have unfurled. Oolong always has three leaves, the first, second and third of the plant. Each leaf has a specific purpose. The first is the newest and most tender, used for white or green tea. Larger and more matured leaves are used for black tea. The floor sweepings and tea dust, politely called fannings, are used in Ceylon tea bags. By the third infusion, we are picking up jasmine and sweetness. The water in the earthen pot has gradually cooled to about 80 degrees. It is not advisable to use boiling water on leaves that have already opened. The fourth infusion Nehemia says is usually his favourite. The tea is now noticeably smoother, but we notice a grassy zest has mysteriously recurred that wasn’t present in the second and third tastings. The tea is sweeter by the sixth infusion, and by the final seventh infusion we are relaxed and enjoying cup after cup of delicious smooth tea. The second part of the ceremony is a demonstration of show flower tea. Dan gui piao xiang is a tea ball made of sweet-scented osmanthus, lily flowers and Yin Hao (silver needle white tea). The tea leaves are moulded into a tight ball (it takes up to 45 minutes to make one) and tied with almost imperceptible string. Placed in a glass pot of water at 80 degrees, the acorn-sized tea ball steadily unfolds, opening up like a flower. One is now offered a pot of tea of your choice together with a delicious vegetable filled dumpling and sticky rice wrapped in a bamboo leaf from a bamboo steamer that has been cooking away during the ceremony. It is accompanied with a delicious, syrupy oyster sauce and a chilli sauce on the side. The tea ceremony with the show flower, a pot of your choice, and the meal costs R125 per person. Gift tags are available, and this relaxing, novel ritual makes a superb present indeed. Nigiro Tea Room, inside Origin, 28 Hudson Street, De Waterkant, Cape Town. Open Monday to Friday, 9am–5pm; Saturdays, 9am–2pm. Tel: 021 421 1000.